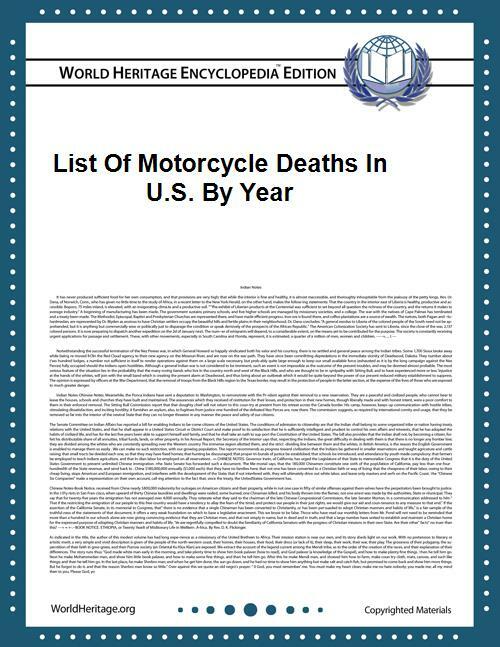 This is a list of numbers of motorcycle deaths in U.S. by year from 1994 to 2010. United States motorcycle fatalities increased every year for 11 years since reaching a historic low of 2,116 fatalities in 1997, until a decline in 2009. In nine years motorcycle deaths more than doubled. From 1980 motorcycle ownership among riders aged 40 and over increased dramatically, from 15.1 percent of all riders in 1980 to 43.7 percent in 1998. The mean engine displacement of the motorcycles involved in fatal crashes also increased, from an average engine size of 769 cc (46.9 cu in) in 1990, to 959 cc (58.5 cu in) in 2001, an increase of 24.7 percent. It has been suggested that the combination of older riders on higher-powered motorcycles might have been partially responsible for the increase in motorcycle deaths from the late 1990s until 2004. Half of motorcycle fatalities in single vehicle crashes relate to problems negotiating a curve prior to a crash—almost 60 percent of motorcyclist fatalities in single-vehicle crashes occur at night. In 2009 motorcycle fatalities in the US declined for the first time in 11 years. The yearly total dropped from 5,312 to 4,469. Automobile fatalities continued to decline for the seventh straight year. A decline in recreational motorcycling due to the fuel economy. A preliminary report by the GHSA estimated that the number of motorcyclist deaths in 2012 was more than 5,000, a 9% increase over 2011.